*To start using Personal time off feature, user needs to perform specific setups. 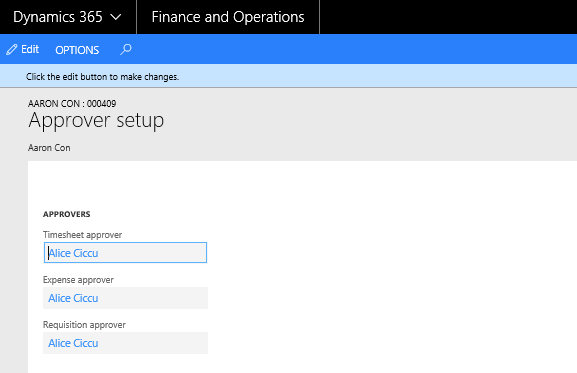 This section details the configuration process. Under the Projects+ parameters, user has to turn on the personal time off field to use this feature. This field is by default turned off. Select the activate Personal time off check box to enable PTO feature. Select the Automatically populate in timesheets check box to populate the approved PTO lines in the timesheets of the resources. A check box is introduced in the project group to indicate that the group is a PTO project group.In the General Fast Tab, select the Personal time off check box in the Project group form to select it to be of the type PTO. All projects belonging to this project group will be implied to be of the type PTO and will be available in the project lookup on the PTO requisition form. Go to Project management and accounting > Setups > Posting > Project group. New fields have been introduced on the Worker form to set up the approvers for the selected worker. The “Assign approver” button opens the Approver setup form, where approvers can be assigned for different kind of documents. Timesheet Approver: The user setup in this field will be the approver of timesheets for the selected worker. Expenses approver: The user setup in this field will be the approver of expenses for the selected worker. Requisition approver: The user setup in this field will be the approver of Purchase requisitions for the selected worker. PTO approvers can be any of the above, as generally the timesheet approvers are the PTO approvers, this flexibility has been provided. Go to Human resources > Workers > Worker and select the Employee record for whom you want to set the PTO approver. Note: The Worker selected in the Workers form should belong to the current legal entity; or else the approver fields will be disabled. Go to Project management and accounting > Setup > Project management and accounting workflow. On the Action Pane, click New button. Select the PTO requisition in the Select form and then click on Create workflow button. 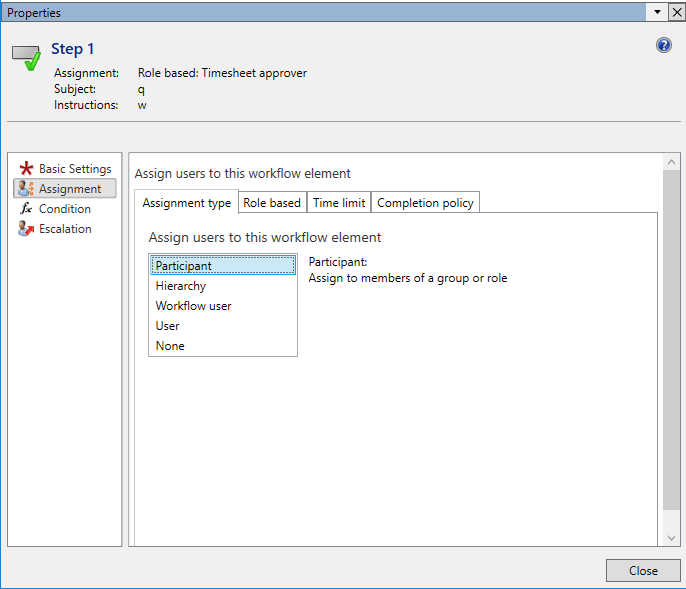 Set up the workflow as it would be set up in Standard, In the Assignment form in the Assignment type tab, choose the assignment to be Participant. Note: Setup the Assignment to be as Participant even for timesheets and expenses Workflow as well, if the approver should be the one that is set in the Worker form.